the first thousand thanks a lot for the program , I have a problem with the version HiAlgoBoost_v2_3c when I run tesv.exe sent to desktop , no errors in the log. Only the version v1_34c is functional in my pc but the log gives errors . 02/01/14  17:00:12 Failed to rename cache to backup for whatever reason. Caching is turned off. 02/01/14  17:02:18 Failed to rename cache to backup for whatever reason. Caching is turned off. I not use any ENBSeries and have carefully read your FAQ , but can not find the solution to operate more updated versions. Operating System: Windows XP32 . Processor: AMD Athlon II X2 255. P. D. Sorry for my poor English. About version 1.34c: it complains that itcannot modify cache files in My Documents\My Games\HiAlgo\ folder. 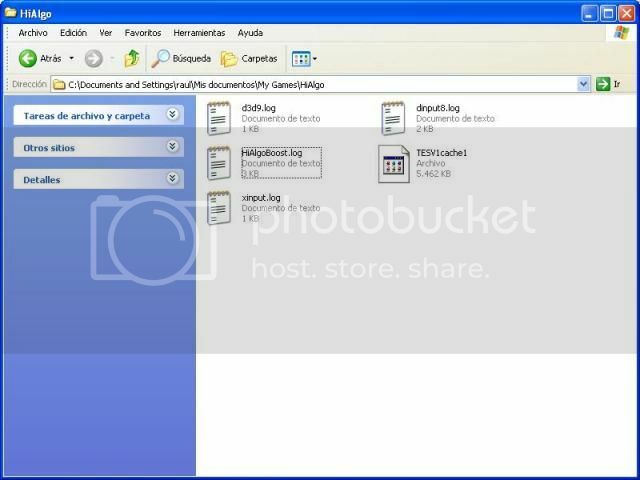 Maybe the files there are readonly or maybe something is missing there... You can try deleting this whole HiAlgo folder and re-installing HiAlgoBoost. But it is much better to use the latest version - see below. 1. Uninstall older version thoroughly. Especially, delete d3d9.dll, dinput8.dll and xinput1_3.dll. 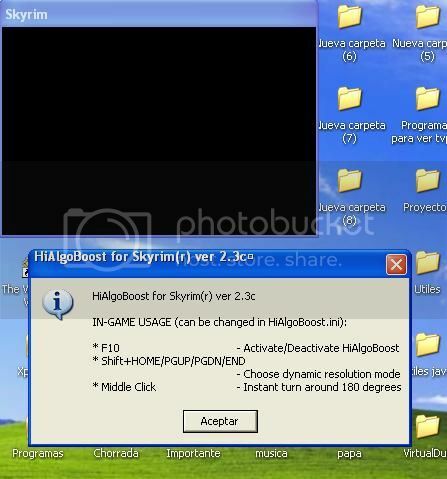 (You may even re-install Skyrim in full). Delete My Documents\My Games\HiAlgo\. 2. Update your graphics card driver and your DirectX 9c -- as described here. 3. Make sure, Skyrim is working OK.
5. If you still have ctd, please post - we will look into it. 02/02/14  03:07:56 Error in file IDirect3DDevice9_wrapper.cpp, line 8460. 02/02/14  03:08:01 Error in file Archiver.cpp, line 287. 02/02/14  03:08:01 Failed to rename cache to backup for whatever reason. Caching is turned off. But the files aren't readonly. Follow this ctd occurs when I press the button the popup with information HiAlgo f10 ... for few seconds the black screen is displayed and ctd. OK, great, you presented all the info. There are two errors in the log. Error in file IDirect3DDevice9_wrapper.cpp, line 8460. -- we are looking into it. 02/02/14 03:08:01 Error in file Archiver.cpp, line 287. 02/02/14 03:08:01 Failed to rename cache to backup for whatever reason. Caching is turned off. And the mod does not crash at this moment: after three seconds it says "Detaching from process...", as if somebody has turned Skyrim off. (Usually, when there is a crash, there is no "Detaching from process..." message). Could it be, you have some protection (again, a very strong antivirus) that does something? Great, the problem "Failed to rename backup cache to for whatever reason. Caching is turned off." is solved, the problem is that I was using the Radeon Pro and The mod program ran 2 times. Now the program again ctd, but sometimes runs, when start the mouse does not work, it is very slow and the middle button does not work. 02/02/14  16:48:29 Error in file MyShaders.cpp, line 1522. 02/02/14  16:48:29 Error in file MyShaders.cpp, line 1523. 02/02/14  16:48:29 Error in file MyShaders.cpp, line 1524. 02/02/14  16:48:29 Error in file MyShaders.cpp, line 1525. 02/02/14  16:48:29 Error in file MyShaders.cpp, line 1527. 02/02/14  16:48:29 Error in file MyShaders.cpp, line 1528. My mouse is a old ps/2 but with the 1.34c version worked fine. P.D. I deleted the file xinput1_3.dll, continuing the error log "Error in file MyShaders.cpp, line 1522." but the mod works fine, the mouse works correctly. Is this file necessary? File xinput1_3.dll is used only for work with joystick. Yes, you can delete it, but it should not make any difference. You say "the mod works fine, the mouse works correctly" -- does it mean your problems (crash, slow motion, middle button) are gone? If not -- have you looked at other log files, especially dinput8.log? Yes, the mod works fine, no lag (in a Atlhon II x2 255! ), crash, slow motion and middle button... all works correctly. The log shows dinput8 no errors. 02/02/14  21:51:02 Loaded dinput8 API. 02/02/14  21:51:03 Created device: KEYBOARD. 02/02/14  21:51:03 Created device: MOUSE. 02/02/14  21:51:05 Created device: MOUSE. And now the video card is a 7450 with the latest drivers XD, things from AMD. Thanks a lot for all QuiteReluctant, you're very polite.